Wishbringer was created to be a beginner-level text adventure in the Infocom fantasy line. The writing task was given to play-tester Brian Moriarty, who crafted Wishbringer and became an Implementor. You are a postal worker in Festeron. Your day-dreams about adventure are interrupted by your boss. 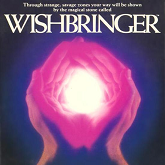 In 1988, Avon Books published Wishbringer, a fantasy and comedy novel written by Craig Shaw Gardner, based on the Infocom game. Wishbringer: The Magick Stone of Dreams (Brian Moriarty; publisher: Infocom; 1985; Z-code 3). Wishbringer is included on both The Lost Treasures of Infocom Volume II and the Classic Text Adventure Masterpieces of Infocom CD-ROMs. Wishbringer - at Peter Scheyen's Infocom Homepage. Wishbringer manual in PDF format - at The Infocom Documentation Project.